If you’re looking for the official data on the number of boxes sold or subscribers for Elder Scrolls Online, you’ll need to wait awhile. That’s mainly because ZeniMax Online Studios, which developed Elder Scrolls Online, is a subsidiary of ZeniMax Media, the largest privately held video games company in North America. As part of a private company, the studio does not have to release a public report on Elder Scrolls Online sales unlike public companies like EA. But there are strong signs that Elder Scrolls Online has been able to attract more than a million players, and topping sales in the US and other countries. Just before Elder Scrolls Online launched, we heard the impressive news that a whopping 5 million players registered for the Elder Scrolls Online beta. But how many of these beta players actually bought the game? And can we classify Elder Scrolls Online as a successful MMO based on this number? To get some answers, let’s look at the physical sales tracked by independent observers and infer the digital sales. VGChartz reports that in its first two weeks of release, Elder Scrolls Online has sold 300,000 physical edition boxes, which include the physical Standard Edition and physical Imperial Edition. These are physical game boxes sold by participating retailers worldwide. Breaking down this 300,000 physical sales count, more than half or 170,000 was sold in North America, a third or 100,000 was sold in Europe with the remaining sold in other countries. Then we need to add the digital sales, which could be as much as triple the physical sales. VentureBeat cited a Lazard report that World of Warcraft’s latest expansion, Mists of Pandaria, sold around 700,000 physical copies from a total of 2.7 million copies sold. That’s nearly a 4:1 ratio, or digital sales almost tripling physical sales. Applying this ratio to Elder Scrolls Online, the game could have sold 1.2 million copies for both digital and physical sales for the PC/Mac platform in the first two weeks. Digital sales will include the digital Standard Edition and digital Imperial Edition which are sold on the official website, Steam and other online distributors. That’s a great number that makes it a contender for the most popular MMORPG release this year. And remember only the Elder Scrolls Online for PC/Mac has been release. The game will likely see another huge spike in sales in the summer months when the console versions for PlayStation 4 and Xbox One come out on June 30. With the end of school and summer vacation and players who may have held back on purchasing the game or have been waiting for the console versions will be grabbing a copy. 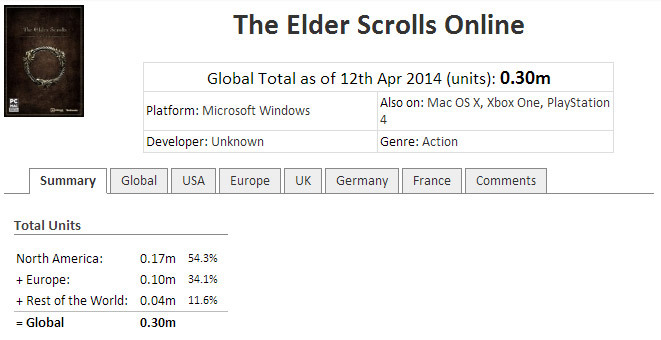 Elder Scrolls Online has sold well in the Western regions like United States and Europe. VGChartz said Elder Scrolls Online was top-selling game in the United States at retail stores during its launch week, with sales more than double the number 2 contender, Titanfall. The MMORPG was also the top-selling game in Europe at retail stores in the same week, clinching number 1 in the biggest gaming markets of United Kingdom, Germany and France. Looking deeper into the United Kingdom sales, the Elder Scrolls Online debuted at the number 1 spot of the individual formats chart tracked by UKIE, the country’s official agency for interactive games. It’s an impressive feat for a PC/Mac title, beating stiff competition from console releases like Titanfall and inFamous: Second Son. 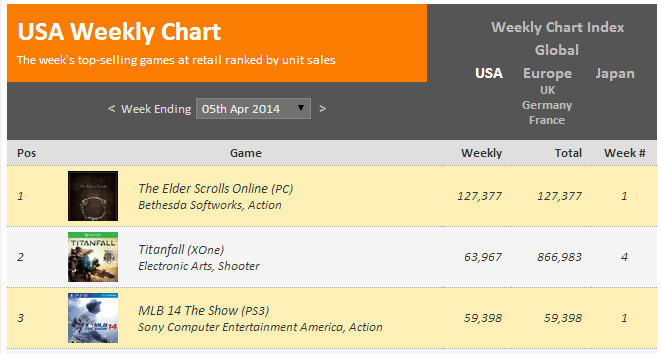 Elder Scrolls Online also came in second in the all formats chart, just behind juggernaut soccer sports title FIFA 14, but ahead of popular shooters Call of Duty: Ghosts and Metal Gear Solid V: Ground Zeroes.